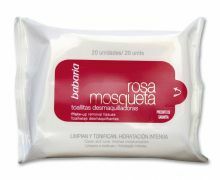 • Use both morning and evening to remove all traces of dirt and make up that collect on your skin throughout the day. • The high Aloe Vera content helps to keep your skin moisturised and protect you from free radicals. • Actively maintains skin's perfect moisture balance. • Won't strip away vital lipids, dry skin, or cause irritation. • To complete you cleansing routine use Babaria’s facial toner. Aqua(Water), Aloe Barbadensis Leaf Extract(puro Aloe Vera 10%), Paraffinum Liquidum, Glycerin, Isoproyl Myristate, Dimethicone, Chamomila Recutita (Matricaria) Flower Extract, Hamamelis Virginiana Extract,Malva Sylvestris Flower Extract, Tilia Cordata Flower Extract, Tricedeth-9, PEG-5 Ethylhexanoate, Phenoxyethanol, Sodium Carbomer,Acrylates/Vinyl Isodecanoate Crosspoylmer,Methylparaben, Parfum. (Fragrance),Propylene Glycol, Ethylparaben, Imidazolidinyl Urea, Ascorbic Acid, Sodium Benzoate, Potassium Sorbate, Sodium Sulfite.